Confident Health communicates evidence-based information about the impact of nutrition and diet to consumers, health care professionals, and the media. That information bridges the relationship of food intake to health and wellness for people of all ages. Sustainability. It’s a global focus on food, farming and the environment. As a dietitian I see the interest from consumers of all ages about this issue. As a food professional I also see the interest of the food industry on meeting consumer demands – and making the food supply safer and more sustainable. In 2018, I had the privilege of visiting Nebraska, one of the largest beef producing state in the country. I got a first-hand view of the efforts of the beef industry to raise cattle and produce meat that is more wholesome and sustainable. Beef sustainability means producing safe, nutritious beef while balancing environmental stewardship, social responsibility and economic viability. Today beef farmers and ranchers produce the same amount of beef with 33% fewer cattle as compared to 1977. To do that, they improved efficiency and animal well-being, and achieved a 16% lower carbon footprint. Fewer natural resources are used for every pound of been produced. There’s a lot in the media about the benefits of grass-fed beef. However, consumers should know that all cattle in the U.S. are grass feed. Their feeding cycle is 6-10 months on grass and other human-inedible plants. In the “finishing” stage they may stay with grass or switched to grain. From a nutritional point of view there is no superiority to consuming completely grass fed meat. There is a flavor difference and, personally, traditional beef is my preference. The nutrient profile of beef is impressive. A 3-ounce serving of cooked beef provides 50% of your Daily Value (about 25 grams) of protein, and 10% of the Daily Value for 10 essential nutrients including iron, zinc, and many B vitamins. Beef is versatile in how it can be prepared: grilling, roasting, and braising are just a few ways to do it. 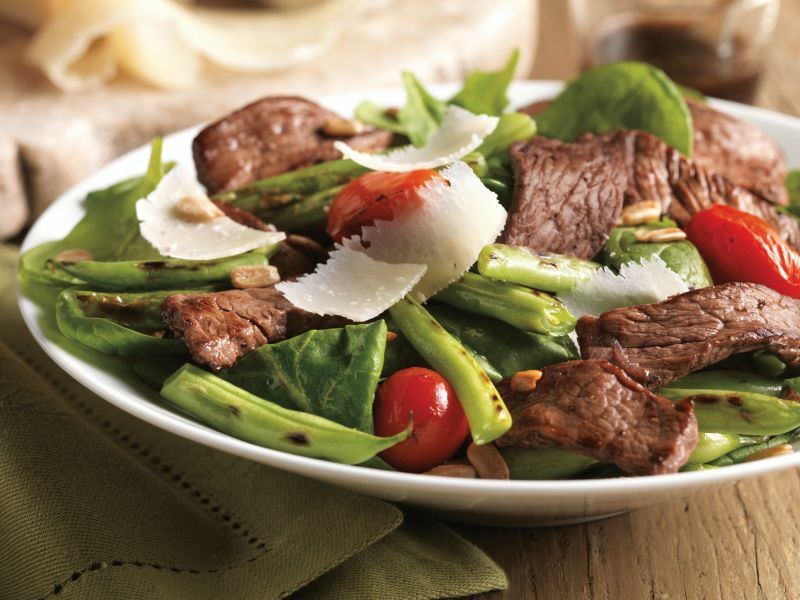 Whether it’s an Asian stir-fry, Texas chili or grilled beef salad, there’s a beef recipe to satisfy any eater. For those concerned about the environment, beef is a sustainable food choice! Hectic holiday schedules can shift priorities. Some people will stop going to the gym, eat irregular meals and snacks, and even cut down on sleep all in an effort to get things done. Sleep, it turns out, may be the most important of all. The connection between sleep and your dietary health is one that is often overlooked. But, the truth is—what and how much you eat depends a great deal on sleep. The average adult needs seven to nine hours of sleep. If you consistently sleep less than seven hours, you open to the door to a long list of health-related issues like diabetes, high blood pressure, and stroke. A focus on good sleep habits can give you a head start on a healthy lifestyle. Sleep deprivation also increases cravings for unhealthy foods like high-fat, sugary snacks. When you’re tired, the rewards center of your brain gets a bigger “hit” from these unhealthy foods, making you far more likely to reach for chips and cookies than carrots and celery. But, the connection goes both ways. The food you eat can also impact your ability to fall and stay asleep. The myth of the Thanksgiving turkey that puts everyone to sleep does have some validity. Turkey and many other foods contain vitamins, minerals, and amino acids used in the production of sleep hormones. These foods can help regulate your hormone levels for better sleep. Tryptophan: Turkey is famous for it but there are other foods that contain it too like milk, cheese, eggs, nuts, fish, and beans. Tryptophan is an amino acid that’s used to make sleep hormones. Carb-Rich: While you don’t want to eat these ones right before bed, an early dinner that includes carbohydrate-rich foods can aid in tryptophan production. When paired with a healthy fat, rice, bread, pasta, dairy products, and potatoes can all bring on extra zzz’s. Calcium: A calcium deficiency can cause wakefulness during the night, according to a study published in the European Neurology Journal. Yogurt, milk, cheese, and leafy greens like kale and spinach can all up your intake. Melatonin: Melatonin is a sleep hormone that starts and maintains the sleep cycle. You’ll want to include plenty of cherries, walnuts, bananas, oats, and tomatoes in your diet as all of them naturally contain it. However, better sleep will take a combination of a healthy diet and good sleep habits. Keep in mind that some people may have underlying sleep disorders that need medical attention. Don’t hesitate to talk to your physician as the solution may be as easy as a mouthguard or therapeutic pillow. Regular Bed and Wake-Up Time: The body will naturally adjust and correctly time the release of sleep hormones. Bedtime Routine: A routine helps trigger the release of sleep hormones. Try to start your routine at the same time every day and perform the activities in the same order. Avoiding Screens at Bedtime: Light plays a pivotal role in the regulation of the sleep-wake cycle. The light from electronics suppresses sleep hormones so try shutting down screens two to three hours before bed. Proper health requires adequate sleep. And, with better sleep, you’ll be able to maintain an active lifestyle. How Much Sleep Do You Need by Age?? This info is actually part of a blog of the same title from TheSleepJudge.com. I was so impressed that I have excerpted part of it here. Enjoy! Sleep time does vary from person to person but it also varies by age. If you have a newborn baby you will know this amount can fluctuate wildly. While you may have a friend whose child sleeps for 17 hours a day you could be struggling with a child that takes several catnaps and only sleeps for about 12 hours. Healthy adults need between seven to nine hours to be at their best as described above but how much sleep do we need as we grow and get older? A newborn baby should be getting at least 14 and up to 17 hours of sleep per day. This is often broken up into smaller chunks due to the needs for feeding and changing. As a baby gets older, at four months old they will start sleeping for slightly shorter times. Between four and 11 months, your child should be sleeping between 12 and 15 hours a day. The tricky thing with children is that sometimes they might start sleeping for 14 hours as a newborn and actually need more sleep as they grow. It is not an exact science! A child between the ages of one and two years old should be getting about 11 to 14 hours sleep. This is a good time to introduce an afternoon nap and then try to get your baby to sleep through for eight to ten hours overnight. At three to five years old, your baby needs ten to 13 hours sleep. Again, they might be still happy to sleep overnight and then take a nap in the afternoon. As they start school, the amount of sleep they need could increase as they are challenged physically and mentally. At six to 13 years old, your child should be getting just a little longer than the average adult at nine to 11 hours. A teenager should be aiming for eight to ten hours. You might find teenagers sleep a little longer than this! All adults should be getting their seven hours or more per night but as you get into retirement age you might find it harder to sleep for longer. A person aged over 65 only really needs seven or eight hours sleep but sometimes a nap in the day can help make up some missed hours if it is difficult to sleep overnight. Check out my latest blog post on Hidden Gems. See what they are and why I talk about @CocoaVia cocoa extract supplement! Summer Food: Keep it Safe! Outdoor meals are fun and casual. Don't let food contamination spoil the fun. Here's some quick tips to avoid that at your next outing. Have you heard about how to avoid peanut allergies in kids? Read my latest blog for the latest info. What's ailing you may be a food allergy or an intolerance. Do you know the difference? This was written as part of my role as an advisor to Americans for Food & Beverage Choice. In the 20+ years that I’ve been a college professor, the comments and questions from students never cease to amaze me. In fact, it’s one of the reasons I continue teaching-- to keep my fingers on the pulse of what nutrition headlines and myths are circulating and impressing people. Nutrition misinformation fascinates me, as does the challenge of clarifying it. For instance, a student recently commented that low-cal sweeteners are “bad” and talked about a study on their unhealthy effects. From what he said, I could tell it was right out of a 1968 study that caught lots of attention in its day, yet somehow still has legs. The problem is the study was done on rats and he clearly hadn’t evaluated the science. I explained where the rumor originated and that evidence shows that low-cal sweeteners are safe and proven to help when used in weight loss programs. I point out that the American Heart Association maintains this position, as do many other health care organizations, like the Academy of Nutrition and Dietetics and the FDA, who affirms that low-calorie sweeteners are safe for human consumption. Science is really the issue and the revelation that nutrition is a science comes as a shock to many students. Yes, nutrition IS a science, and one study, on rats, does not a body of evidence make. On the flip side, are the students who believe sugar-sweetened beverages make you fat? The evidence shows otherwise. Excess calories and/or too little activity contribute to weight gain. Obesity is a complex issue that cannot be simply attributed to one dietary ingredient. All calories count and balance really is key. A myth I often hear is that when it comes to produce is “fresh is best,” while canned and frozen items should be avoided. Not so. Due to the transportation and storage involved, by the time they are cooked or consumed fresh fruits and veggies have lost nutrients. Frozen and canned items are processed immediately after harvesting so nutrient loss is minimal. What’s important is to purchase fresh produce in season, know your vendor, that turnover is quick, and prepare soon after purchasing. I could go on and on. There are two important considerations in nutrition. One is to take time and know the source of the information; go beyond the headline. The other is balance. That means balance in food choices and balanced opinions. There is no reason to demonize one food or one ingredient. Hidden beneath the dramatic headline is generally a fable that people mistake for fact. My latest blog on sleep: an important marker for Confident Health! Better Bones - with a twist! October 20th is World Osteoporosis Day. Here's my tips about bone health and ways to protect them. Confusing information about fat is everywhere. This simple breakdown provides the basics of what's important to know. Snack to your advantage: Mindfully! America is a nation of snackers. According to a recent Neilsen survey 91% of adults snack at least once a day, including 25% who say they snack 3-5 times a day and 3% who claim to be always nibbling. Among the favorites are chips, chocolate and cheese. Fresh fruit comes in at fifth among choices. When it comes to the health and nutrition of snacks, experts seem to be divided. Some claim there are benefits like helping to lose and/or maintain weight; others focus regular meal patterns and not skipping meals instead of snacks. While there is no consensus what stands out is that both meal and snack quality is more important than frequency. That means considering lifestyle (active vs. sedentary), health (good vs. diabetes or other), emotional state, and a host of others. As a dietitian, I tend to favor snacks. They can contribute nutrients like calcium, fiber, vitamin D and potassium which most people under-consume. To do get those nutritional benefits means to think before you act. So I suggest people ask yourself two crucial questions: “Am I really hungry,” and “Is this what I really want?” If the answer is "yes" to both, I say do it. If not: wait. This notion of giving more thought to food choices is now known as "Mindful Eating." It involves paying deliberate attention to what, when, where we eat; physical and emotional state; savoring each bite, appreciating the aroma and other aspects of eating. It is just as important to be mindful about snacks as it is for meals. Individual, portioned-sized foods are a good way to start with snacks. Apples or poprcorn are a simple choices for a crunchy snack; a container of yogurt or a piece of Laughing Cow cheese will satisfy a creamy craving. Because you have to unwrap the cheese, it's a perfect way to take a moment, slow down, and savor the moment - and the snack. You might pair the apple and cheese if you're looking for a combination of tastes and textures. A simple glass of chocolate milk is a great choice when you're thirsty and want something sweet. What makes all of these smart nutrition choices is that they boost your intake of nutrients like potassium, fiber and calcium. Snacks can run the gamut of creamy or crunchy; sweet or salty; hot or cold; savory or spicy. Yes, you can have it all when you do it mindfully - and savor the moment. That's Confident Health! Photos courtesy of Laughing Cow; tips at #reinventsnacking. Nutrition has an impact on focus and concentration. Research shows some foods, and at least one supplement, can help improve it. That's Confident Health! July is a time for celebrations. On the Fourth, all Americans celebrate the independence of the United States of American. It's also Blueberry Month, and this year commemorates the 100th year of cultivating farm to table blueberries. If you're fortunate to live in the Washington DC area you can participate in the festivities. On Tuesday, July 16, free blueberry cupcakes will be distributed at Farragut West.. All month Food Truck Bike Tours will feature blueberry items, and you can sign up here. The reasons to celebrate, however, have become more than notable when it come to health. Sure blueberries are low in calories (about 80 per cup), and they're loaded with vitamin C, a good source of manganese (a mineral that helps process nutrients like cholesterol, carbohydrates and protein), and contributes dietary fiber. They are also loaded with plant nutrients known as polyphenols. That's gives them antioxidant activity in the body, protecting cells from damage. The benefits of supporting heart health may be blueberries biggest claim to fame. However, research shows they also promote brain function, maintain a healthy gut and help with diabetes and insulin resistance. In other words, these little blue dynamos can provide big health benefits. Fresh blueberries are plentiful in the market right now - and at great prices. There's no end to the versatility of blueberries. Add them to salads, desserts; blend them into sweet or savory sauces; or eat them right after they've been rinsed. And don't be at the mercy of running out of fresh blueberries: buy a bag or two to keep in the freezer, and keep dried blueberries on hand to mix into homemade muffins or granola. Who knows when the next when the next celebration will pop up? For more information and recipes click here. The US Blueberry Council is a partner and provided info and a graphic for this blog; no compensation was received. Trying to lose weight this summer? Take a look! Know the Facts & Make Better Choices! This was originally written as being an advisor to Americans for Food & Beverage Choice. Get ready. Get set. New Dietary Guidelines for Americans (DGAs) are coming. Every five years, as a joint effort, the U.S. Department of Health and Human Services and the U.S. Department of Agriculture evaluate the latest science and research on nutrition, diet, and health for Americans over the age of two. The 2015 revisions will be released in the next few months. Despite all the widespread hype regarding sugar, the intake of added sugar has actually “decreased for both males and females across all age groups…” according to the recently released Scientific Report of the Dietary Guidelines Advisory Committee. Clearly it’s progress. What is evident throughout the document is the element of choice. The report encourages individuals to combine foods in a variety of ways and develop a personalized plan to achieve their own diet and activity patterns. Though the focus is on an overall pattern of diets high in vegetables, whole grains, and nuts and low in fatty and processed meat, they also say “…it is not necessary to eliminate food groups or conform to a single dietary pattern…” Words like “flexible” are frequently used. In order to make healthy behavior changes with targeted interventions, it’s likely the new DGS will recommend education as the route to help Americans balance their lifestyle. Though there is a mention of disincentives (that might imply a tax on certain items), let’s hope that part does not make it to the final version. Singling out just one source of calories will have little benefit to the American diet- it needs a much more comprehensive view. Partnerships with schools, worksites and the food industry are just a few ways to step up education. Better education leads to better choices. That’s what works and, ultimately, that means healthier Americans.